Note that the foundation for a hard edge can be sited below the liner, providing the liner is protected with fibre matting above and below. 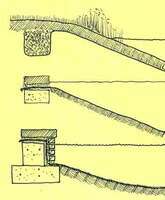 A pond liner can be secured with an anchor trench (top) or with an edgestone and concrete collar (middle) or sandwiched between a concrete foundation and a brick or stone surface (bottom). It is best to protect the liner with a fiber mat, particularly where it would otherwise be in contact with a hard material (brick, concrete etc).